1. Describe Scarlet Woods in three sentences or less. Scarlet Woods is a love story about a boy and a girl from two separate times who are able to travel to each others' centuries whenever they go through this door in the woods behind Morgan's house. They both live in the same town in Georgia but since their centuries are different it’s like walking in a place that’s very foreign and new to them. As they time travel together they start to see the pros and cons to each century they are in and also start to build feelings for each other. 2. Why did you pick the Civil War era? I love this century, especially in the South. When I first was thinking of the idea of this story I at first wanted it all to take place in Missouri and not really mention anything about the war, but then the more I started to think about my story’s plot in the nineteenth century and my characters’ involvement in this time period the more I knew I had to involve the war and in a state that had a bigger part in it. Scarlet Woods is the first book in The Scarlet Woods Trilogy and as the books continue on the Civil War has a huge impact on everyone’s life and will start to change everything. 3. Who would you pick to play Morgan and Danny in a movie? Oh gosh that’s such a hard and exciting question…For Morgan if the actress was a little bit younger I’d choose Lyndsey Fonseca who is on Nikita. (I don’t watch the show but I’ve seen her in other things and think she’s a great actress.) She has the perfect look that I describe for Morgan and has the exact features that I picture Morgan to have. And actor who would play Danny is a very hard question. I really don’t even know this myself. I picture him as a young Matt Damon type but really couldn’t pin down who would play him nowadays. He’s one of those guys in my head who you know is hot but can’t paint a clear picture of his face. 4. How many books are planned for this series? There will be three and I’m writing the sequel now, hoping to be done with it soon. 5. If you could time travel to a certain place and time, where and when would you travel? If I could choose a century to time travel to I’d probably choose the Victorian age, the roaring 20’s, the 1950’s, or the 1940’s. I think the Victorian age and the 1940’s were probably the most romantic eras in history and the 20’s and 50’s would probably the most fun! I’d like to be in New York probably in any of those time periods, aw so cool! I write a lot so that takes up most of my time, but when I’m not doing that I am fairly boring. I like to watch TV (Vampire Diaries, Glee, The Bachelor, Dancing with the Stars, Once Upon a Time). I love to read too but haven’t really read as much lately as I would wish. I mainly hang out with my family and friends and play soccer every Sunday. 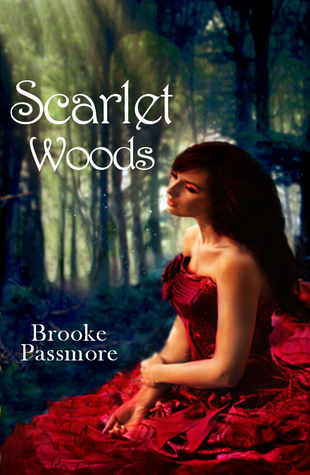 I am writing the second book to the Scarlet Woods Trilogy right now and I hope to be done with that soon. After that will be the third and final installment of the series and I'll be able to move on. I plan on writing a book that isn't a part of a series that's an intense, thrilling love story that I've had in my head since I was in tenth grade. Part of it has been written but I can't truly focus on it until my Scarlet Woods Trilogy is done. After that I have an idea for another Trilogy that's more fantasy/science fiction. I just came up with the idea this year and have started writing that sometimes too, but The Scarlet Woods Trilogy comes first. I have far too many to count. I love watching Scrooge (musical of Christmas Carol) with my family and also It’s a Wonderful Life, it’s not Christmas without watching those with the fam.